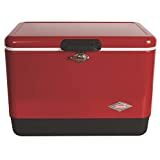 Whether you are an angler, hunter, or outdoorsman, there is one common thing that you will need when going for a hunt, and this is the best cooler. Such coolers can help you carry extra drinks and food and maintain them in a cool and fresh state so that you can have something to consume when you need to refuel. Besides that, these cooler allows you to store your catch and maintain it fresh based on the ice life of the cooler so that you can take home a fresh catch. 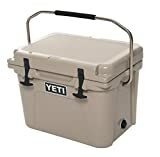 The only challenge you are likely to face when you are looking for an ice chest cooler is locating the best based on the various models available on the market. To help you locate the ideal unit, I have narrowed down to the top 10 best ice chests in 2018. For you to select the right unit, pay attention to the size, ice life, durability, portability, and extra features such as cup holders and ease of cleaning. That way, you can get an ice chest among these products without a doubt of acquiring the ideal unit. Are you looking for a heavy-duty cooler that is suitable for heavy-duty users such as hunters and commercial fishermen? If that is the case, you will not go wrong once you get Igloo Super Tough STX Cooler. The reason is its bolt-through body, the heavy-duty backup plates that support heavy loads, and the dual stainless steel latches that ensure a secure closure. More to that, the cooler features UV inhibitors that guard against sun damage so that you can be sure of acquiring an ice chest that will last for long. Something else that makes this cooler one of our top picks is the threaded drain plug. This acts to enhances fast drainage so that you can have an easy time when cleaning it. 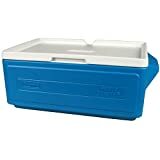 Apart from that, the ice chest includes a fully foamed lid that enhances maximum cold retention to allow it to hold ice for seven days at 90°F. The stainless steel lid straps are other additions so that you can be sure of greater lid security. You can also expect to see four cup holders molded into the lid to enhance easy holding of water bottles or other drinks. Made from the highest quality materials, this is one of the best ice chests for those looking for one that is designed to last. The ice chest can hold canned drinks as well as dishes in its wide 13″ x 9″ base. Also, it can hold extra coolers so that you can organize more drinks to ensure that you take something for every person. The cooler comes in different colors among them grey, green, blue, and red. Are you looking for an ice chest cooler that will stand up the rigors of the journey wherever you take it? Well, this is the cooler you have been looking for. It features a sturdy construction which makes virtually indestructible. On top of that, the cooler features T-Rex lid latches which are made using heavy-duty rubber and a patented technology so that you will never see a busted latch. Due to the NeverFail hinge system and the interlocking design, you can be sure that the hinges will not break from too much pressure or a lot of use. The cooler can keep your ice for extended periods, thanks to the 3″ of PermaFrost insulation and the thick FatWall design. It measures 18½” x 135/8″ x 143/8″. You can use it to hold up to 14 cans where the recommended ice to contents ratio is 2:1. Another Coleman product is the Xtreme Series, Wheeled Cooler. It measures 17.8 x 12.9 x 13.1 inches while it features a 50-quart capacity that enables it to hold up to 84cans. Apart from that, the cooler features heavy-duty wheels and a telescoping handle. Because of this, you can be sure to have an easy time transporting it over any terrain. You can expect the cooler to retain its ice at 90 degrees Fahrenheit for five days due to the insulated lid and walls. Also, the cooler can hold drinks on the integrated cup holders to provide you with an easy time when you want to access them. 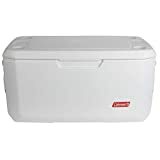 Meet another product from Coleman, the 70-quart Xtreme cooler. The cooler can hold up to 100 cans in its 70-quart space. Also, it features four 2″- deep cup holders on the lid to allow you to keep drinks handy without causing any spills. Due to the no-crush comfort handle, you can be sure to have a great experience when carrying the chest cooler. Apart from that, the cooler features a sturdy lid that supports up to 250lbs to allow you to have a place to sit and rest. With it, you can be sure to have a chest cooler that is easy to clean due to the Retextured EZ-Clean top. The cooler can keep ice for up to 5 days in a 90°F-temperature due to the Xtreme® 5 Technology. Its insulation doesn’t contain HFCs, CFCs, or HCFCs, meaning that it is safe to use. Keep drinks cool for a long time with Igloo’s Ultratherm insulated body. The chest cooler measures 20 x 18.5 x 20.69 inches where it features a 60-quart capacity. 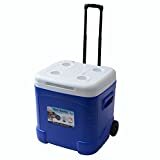 With it, you can be sure to have a cooler that is easy to transport due to the ergonomic design that makes it easy to lift and the push button release telescopic handle that makes it easy for you to wheel the cooler. The unit includes molded side scoop handles that makes it easy for you to load and unload and four cup holders molded into the lid to allow you to keep drinks handy without any spills. Maintain your drinks and food in a fresh and cool state with Coleman 48-Quart Cooler. The cooler keeps ice for up to 3 days at a 90°F temperature so that you can maintain fresh food for three days. Also, it lets you access the drinks fast due to the hinged lid that allows for a one-handed access. You can use the cooler to store up to 63 cans whereas you can hold 2-liter bottles in an upright position due to the added height. The cooler is easy to clean, thanks to the leak-resistant drain that allows you to remove the water without having to turn it upside down. With it, you can be sure to have an easy time while lifting due to the 20way handles. More to that, the cooler assures you of reduced carbon emissions from foam manufacturing due to the low CO2 insulation. 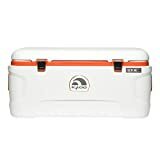 Specially designed for fishing and boating, you will love Coleman portable cooler due to its rugged design that stands up a lot of conditions. The cooler is equipped with rust-resistant stainless steel hardware making it suitable for use in an outdoor environment. In addition to that, the cooler features a UVGuard sun protection that resists cracking and yellowing so that you can be sure of getting a unit that is built to last. Once you get this cooler, you can be sure to have the best ice chest that will let you keep food fresh for a long time due to the insulated lid and walls that provide up to six days of ice retention. On top of that, the cooler adopts the Xtreme 5 Technology which enables it to keep the ice at 90°F-temperatures up to 5 days. You can use the ice chest to store up to 204 cans since it features a 120-quart storage capacity. The ice chest is easy to clean, thanks to the smooth EZ-clean lid and the threaded drain that lets you empty excess water without tilting the cooler. Also, it is easy to take along since it features no-crush handle grips that enhance ease of lifting and a large tow handle and all-terrain wheels that makes it easy to pull. Featuring a 54-quart capacity that accommodates up to 85 cans, this is one of the best coolers for those who are in need of one that will hold enough drinks for a group. Apart from that, the cooler serves as a perfect choice when you are in need of one that will deliver years of performance due to the stainless steel hardware. With it, you can be sure to keep fresh drinks and food for up to four days since it features an insulation that keeps ice for up to 4 days at 90 degrees Fahrenheit. Whats more is that is that the cooler is easy to clean due to the leak-resistant channel drain that makes it easy to empty the water. Concluding our list is a cooler from Igloo which serves as our best pick. 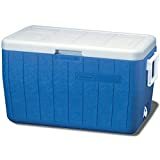 The cooler features an Ultratherm insulated body and lid that maintain ice for five days at 90 degrees Fahrenheit. Also, it features dual snap-fit latches that secure the lid closure and a quick-access hatch that allows you to access content fast without allowing for the cold air to escape. The cooler is easy to clean due to the threaded drain plug that enhances easy draining. With it, you can be sure to have an ice chest that is easy to carry since it features reinforced swing-up handles that feature a tie-down loop feature. The cooler can hold 145 cans plus ice, and you can also use it to hold 2-liter bottles in an upright posture due to the added height. 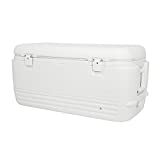 I hope that this review has helped you locate the best ice chest for the next trip. After all, nothing feels great that having fresh and cold drinks to keep you cool and refreshed during the warm summer. Therefore, give these products a try since they have the best positive reviews from the previous clients whereas they are availed at affordable prices.